24 oz. 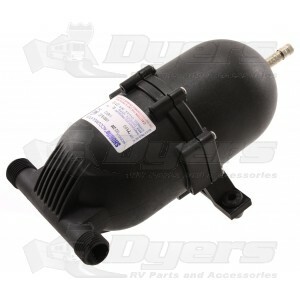 pre-charged accumulator tank reduces cycling and extends pump life. Internal bladder keeps air from dissolving into the water. SHURflo’s Pre-Pressurized Accumulator Tank smoothes water faucet pulsations and reduces pump cycling to keep water line pressure up and pump motors cool. The SHURflo accumulator tank reduces plumbing system noise, increases the life of your pump and saves battery power. I installed a flash water heater, and it needs a steady flow to function properly. The accumlator tank stopped the surging of the waterpump. Just what was needed. It even cut down on the pump noise, without the silencing kit. Quick and very easy to install along with the Pump Silencing Kit and a few of the SHURflo fittings. Seems to reduce pump cycling and even out the water pressure. Order received very quickly from Dyers. Dyers is a great company to order from. They matched a price that was lower from another company and I received the part the next day. I have not yet install this part but my previous RV had one in it and it made a big difference.